USA Cycling revealed, last week, its new National Team, a concept that has not been formalized for almost two decades. Fifty one athletes were named to the initial team and will serve for a year. After that, membership will coincide with the season of competitors’ respective disciplines. There is no cap on how many members can be added to the team and membership can be earned by meeting a menu of varying milestones. The US Olympic Committee and the USA Cycling Foundation contributed matching $500,000 investments to fund the new National Team. Athletes competing in Olympic disciplines can earn, at the gold and silver levels, a cash stipend, coaching and performance services through the Olympic Training Center. 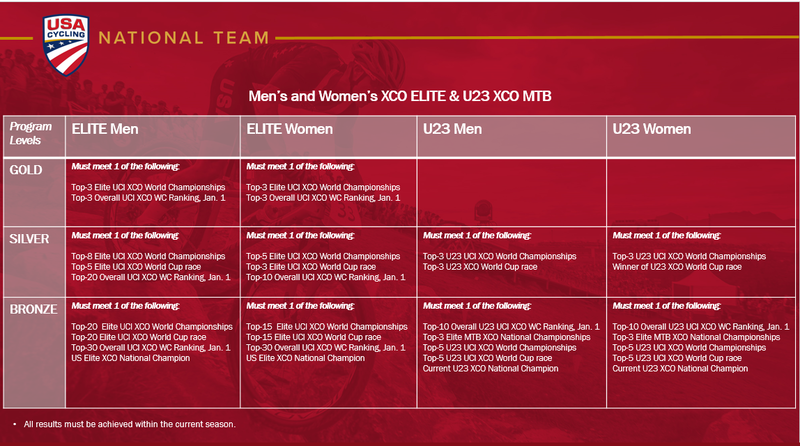 Non-Olympic disciplines, namely cyclocross and downhill mountainbiking are not eligible for the USOC benefits and are relegated to the bronze level. A level reserved for “up and coming athletes” in Olympic disciplines. Non-Olympic sport athletes can still reach a gold or silver level, but those levels are not equal to their Olympic counterparts. Cyclocross gold is equal to Olympic bronse. And here’s the rub. The National Team is a fantastic development that is going to help US cycling. The commitment and clear pathways from USA Cycling show a level of transparency and clarity that we haven’t seen in quite some time. But if you do not compete in an Olympic sport—the primary goal here, after all, is to win seven medals at the next Summer Games—you are treated as a lesser athlete. You don’t have access to the cash stipend or performance benefits, because those are reserved for Olympic athletes. Not affording non-Olympic athletes access to the Olympic Training Center and services is understandable. That seems like a no-brainer. Those benefits are reserved for Olympic athletes in any sport and cyclocross and downhill aren’t olympic sports. But the cash stipend seems more troublesome. That just comes down to priorities. Matching funds were contributed by USOC and the USA Cycling Foundation. The cash stipends come exclusively from the USOC pot, which means none of those funds are earmarked for cyclocross athletes who attain the gold or silver level. Why the USOC exclusivity for stipends? Why can’t some of the USAC Foundation funding be put aside for this purpose? What is the barrier to doing this other than it isn’t a USAC priority? That’s the difficult part to swallow. You may notice that no downhill athletes are on the team. There are certainly those who are eligible. We have some of the best in the world. But there’s no incentive for those athletes, who have decent sponsorships, to deal with the sponsorship conflicts the team creates. The complications for them are not worth the honorary bronze-level recognition. It bears repeating: This program is a good thing. But we need to find a way to include cyclocross in the mix. The discipline is a force in American cycling. There has to be a way, short of ‘cross becoming an Olympic sport, to make the support from USA Cycling look like other disciplines. A goal of this program is to give younger riders a clear path to what gold-level success looks like in their sport. Young cyclocross riders will be excused if they look to the path next to them, be it road, BMX or XCO and think … I’m on the wrong path. Cyclocross in the Olympics? That may be the answer. That may be worth getting behind. Derek Bouchard Hill, President & CEO of USA Cycling, and Scott Schnitzspahn, Vice President of Elite Athletics, explained the details of the program to the media, December 13, at the Olympic Training Center in Colorado Springs. Here are highlights of that presentation. UPDATE: The other notable issue with the selection of the National Team is the more restrictive criteria assigned to the selection process for women. There may be a perfectly sound reason for the tighter selection criteria for women and we have asked USA Cycling for an explanation. As of today, we have yet to receive an answer. The discrepancy can be seen on the chart below. I’m using XCO MTB as an example, but the different standards exist across the board (the one exception is sprint track, in which men and women are equal for all levels). First big point to make is that for the Gold level (top row), men and women are treated the same. The discrepancy exists at the bronze and silver levels. Elite men must finish in the top 8 at World Championships, top 5 in a World Cup race or Top 20 overall in the World Cup Ranking. Elite women mist finish must finish in the top 5 at World Championships, top 3 in a World Cup race or Top 10 overall in the World Cup Ranking. U23 men must finish top 3 at U23 World Championship or top 3 in a U23 XCO World Cup race. U23 women must finish top 3 at U23 World Championship or WIN a World Cup race. Elite men who finish in the top 20 at the World Championship or top 20 in a World Cup race will make the team. For elite women, it’s top 15 at worlds or top 15 in a World Cup. Men and women are both eligible if they win US Elite national championships or finish in the top 30, overall, in World Cup ranking. Is the reasoning behind the discrepancy that respective field sizes for men and women? If so, this is a red herring. Size of field does not dictate quality of field. Those are world cup apples against world champ oranges. Is the reasoning behind the discrepancy the quality of women cyclists in the US? In other words, are they a victim of their own success? If anything, this should be a reason to attract as many women into the program as possible. Both Bouchard-Hall and Schnitzspahn emphasized the importance of women cycling to the program. Women are being counted on for Olympic medals in several disciplines. The prospects for American men, especially on the road, are not as bright. A point also made by Bouchard-Hall in the leadership panel. If the National Team is dominated by women, this is a reflection of the quality of athlete in the US. Restrictive eligibility requirements should not be put in place to ensure parity between men and women. The exact reasoning is unknown and the above is purely conjecture. As mentioned, we have reached out to USA Cycling for an explanation of the different requirements. When we find out more, this post will be updated. More video from the MTB and BMX athletes to follow. Previous Previous post: Crosshairs Radio Episode 100 | CXNATS Giveaway!